To supplement or not to supplement, that is the question. We are sure you’ve been told left and right to take an assortment of vitamins, minerals, and other supplements to stay healthy. But is there any truth to taking them? Those who oppose vitamins argue there’s not enough evidence to show the benefits. Furthermore, they explain that in large doses certain nutrients can become dangerous. For instance, two common nutrients, Vitamin A and Vitamin E, have been linked to higher instances of illness and lowered life expectancy. Additional studies have also found antioxidant supplements to have zero effect on the body. Clearly a vitamin produced in a factory ought to have no competition with real foods. Real, whole foods come packaged with an assortment of co-factors, antioxidants, fiber (if plant based), macronutrients (protein, carbs, and fat), and compounds that go above and beyond what a little pill can supply. We’re also discovering more things about foods everyday, identifying new powerful substances that can dramatically benefit our health. Therefore, when it comes to comparing isolated vitamins found in supplements and the assortment of nutrients from whole foods, there really is no contest. Proponents of vitamins claim there are many benefits to vitamin supplements. These include supporting nutrient absorption, disease prevention, and increasing longevity. Even healthy individuals tout the benefits of vitamins, stating they feel better overall and are even more energized. On a serious note, the Council for Responsible Nutrition strongly opposes the notion of vitamins being useless, counter-arguing that supplementing with them can be extremely beneficial for people who do not get enough nutrition from their food. And there are some legitimate cases when this does happen. This includes disorders and conditions like Celiac disease when the body cannot fully absorb nutrients from food, therefore requiring extra support in order to prevent deficiencies. Genetics must also be taken into consideration. Those with the MTHFR gene mutation cannot process folic acid (Vitamin B9) from food, and will therefore need to supplement to yet again ward of a deficiency. Therefore, it would be wrong (and potentially dangerous) to discount vitamins altogether if these exceptions aren’t taken into consideration. Repeating what I said before, it’s all about context. First off, there’s no argument that real foods are the clear winner when it comes to getting your vitamins. They provide additional nutrients, and are much cheaper. That being said, vitamins may also help people with certain health issues. The key is to pay attention to your body and see whether or not they fit in with your lifestyle. Here are some things to consider before choosing whether or not vitamins are right for you. If any of these rings true, then first and foremost go and get checked by a doctor. Make sure you’ve identified the problem before jumping onto any supplement. If none of these apply to you, but you still want to take vitamins, here is some general advice when it comes to supplementation. First, don’t overanalyze any studies, research, opinions, articles or podcasts talking about them. It’s ok to get different opinions to further round yours out, but not at the expense of doing nothing or going in the complete opposite direction by taking every single nutrient or compound known to man. That would not only cost you a fortune, it would probably consume your whole life as you take hundreds, if not thousands, of pills all day everyday. Which leads me to point two. Just because a respected authority in your wellness circle is taking a specific vitamin doesn’t mean you have to. Don’t take supplements willy-nilly based on the current trends and fads. 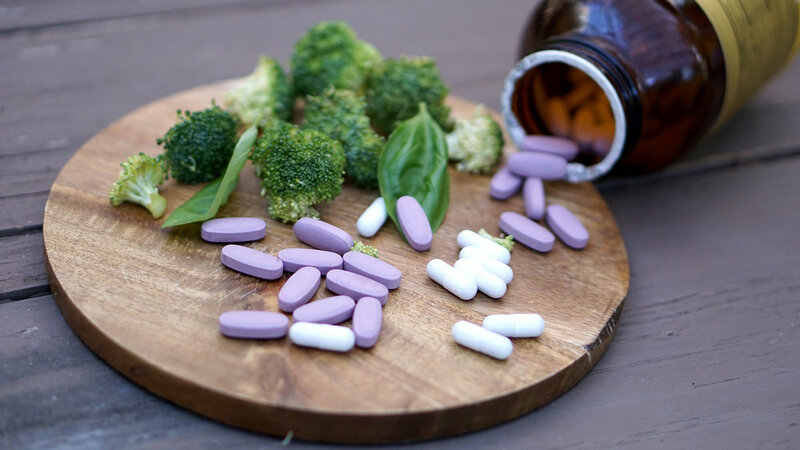 Third, stick with the basics (but of course check with your doctor if you have any hesitations)- a basic multivitamin, fish or algae oil, and probiotics go a long way. Vegans would be wise to invest in a good Vitamin B12 if their multivitamin is lacking in it. For everyone else, additional Vitamin D might be useful, especially if you avoid the sun, spend a lot of time indoors, or live in a cloudy environment. Finally, keep this in mind when it comes to diet vs supplements. A supplement is meant to fill in the gaps of an otherwise well-rounded, healthy diet based on whole, unprocessed real foods. Strive to get all of your nutrients from food, and let your vitamin fill in any potential gaps. There will be days or times when you’re not completely on top of things; travel, holidays, and work can all make it hard to stay sufficient. So the vitamin comes in handy in these instances. But they are not an excuse for eating poorly. And there is no cure-all in the vitamin world; no pill is going to make you immortal or strong like Superman. In conclusion, there’s a time and place for everything. Vitamins can be extremely beneficial for pre-existing conditions or problems that make it hard to obtain enough nutrition from food. They are also a nice form of insurance for otherwise healthy people. But they are no match for the life-nourishing powers of food. Our food is medicine, and comes first.